The world over celebrates this day in honor of Jesus Christ who rose on this day after dying for our sins. This very special day comes after His triumphal entry into Jerusalem (Palm Sunday). Our very own Big Brother Africa super ladies have spared some time for us and wished us a nice one. It's non other than Namibian beauty Dillish Peya Mathews who won 'The Chase' edition in 2013 and Botswana dame Goitse April Kgaswane who was part of the cast in 2014. 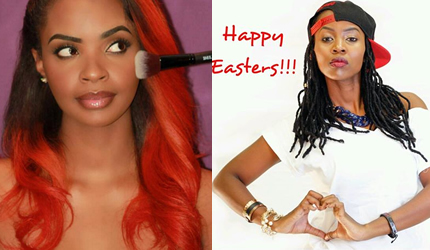 In a simple Easter message, Dillish signed off: "Happy Easter weekend my lovies." While Goitse had this to say: "Happy Easter!!!" A very warm and Happy Easter family!